A prolific shoplifter struck again to raise money after she had to hand over cash to stop her criminal sons being assaulted, a court heard. Fiona Hodgson stole two steaks, worth £25, from Marks and Spencer, after people had turned up at her door making threats. 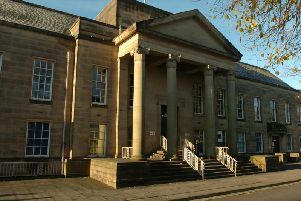 Burnley magistrates were told how the alcoholic 59-year-old had paid the people out of her benefits. Hodgson was challenged by a staff member after she was spotted trying to hide the meat under her coat. The steaks were recovered from a bush and had to be destroyed. At the time, she was subject to a conditional discharge, imposed after she had been shouting abuse in Iceland. She had been detained by staff and carried on shouting after she was arrested. Mr Mark Williams, defending, said Hodgson had a significant drink problem and long-term problems with drugs. She was on a methadone prescription and also suffered mental health problems. The solicitor continued: "She has two lads still living with her, who regularly appear before the court. She had people at the door yesterday, making threats and had to pay money from her benefits to stop them being assaulted. The stress of everything just gets too much for her." Hodgson, of Hudson Street, Burnley, admitted theft, on March 20th. She was given a four-week curfew, between 7pm and 7am, seven days a week and must pay £25.49 compensation. As the defendant, who sobbed during the proceedings, left court, she told the Bench: "I'm really sorry." The chairman replied: "You were saying that last time you appeared before me. It's not good enough."